Introducing the Sony D-EJ01, the Worldâ€™s first Magnesium Die-Cast CD Player. It features a slim design and a futuristic, high-tech look. The main purpose of using a magnesium die-casting is to create a light and yet strong set. This material also allows the set to be made slim (19.5mm height on the thinnest part of the set). The D-EJ01 is beautifully shaped into the size of a CD. All I can say is, 10 years, yeah 10 years and this PCDP still works like new, did some lens cleaning and that's about it. Still works like a charm. Took this out of storage after the rage in mp3, decided to go back to uncompressed, now having a great time with my CD collection once again. This has been bar none the best cd player i have ever owned or handled. It has preformed flawlessly for over 6 years. The most amazing option that it has is the optical output. That is pretty much unheard of for a portable cd player. I am kinda surprised that apple has yet to put something like that on any ipod. Slot loading system and the remote control. The Mega Bass control allows me to control the low end sound for different types fo music. None. I had two and one was destroyed in floods in 2001. Wish I could find another. I have used this fine player for almost six years and it is always a pleasure to use. The front slot loading system has worked flawlessly for years and I wish Sony had continued it. I have treated it with great care and it has never failed. The remote control is easy to read and functional. The sound has always been great and now using it with Shure SE530's it is a dream to listen to. Strong, compact build. Legendary line-out (personally untested) Slot loading Convienient rechargable batteries. First impressions: The sound from the headphone jack is a bit boomy, seemingly sacrificing detail for punch. The stereo imaging is noticeably more accurate than most other sources I've listened to. On lesser headphones, I'd imagine the sound made by the headphone jack on this player is pleasant, but with my Sennheisers (HD 535) it doesn't quite come off as clean as it should. It's hard to explain, but it sounds like the detail is present, but its being mudded over by some mega bass filter. This would seem to coincide with what I've read from other sites that the real beauty of this device is in it's line-out. So now I'm awaiting a total airhead amp as well as a pair of Etymotic E4-S to work the full potential from this player. Mechanically, the player seems reasonably sound. The slide-loader mechanism is solid, though the plastic piece that slides down to cover the slot during playback seems a bit flimsy. The battery cover also seems fragile. Lastly, the buttons on the player itself seem cheap. But really these are the only minor complaints, made more visible by their contrast to the quality of the rest of the unit. It has nice rubber footings. I like nice rubber footings. The player can run for 20 hours off of internal rechargable batteries. There's two of them, and they look akin to thick sticks of gum. To recharge the batteries, you simply leave them in the player and plug it in. There's even an indicater LED on the player to show that it's charging. There's also an external battery pack included. It's about the shape and size of a cigar, and it holds two AA batteries. Supposedly this can run the system for 50+ hours, but I have yet to test that. Revolutionary 4 years ago, the battery life of this player is common on most players today. So to sum it up: Headphone out is not suitable for audiophile-level playback, so look at getting an amp if you have high-end headphones. Build quality is solid, with a couple of questionable choices. Battery life is adequate and recharging is convenient. Not a bad deal for $115, but I wouldn't pay a whole lot more. The slide-in disc loading mechanism is awesome (there are no others like it). The LCD remote is excellent! The audio quality is the best I've heard.I have really made some up grades headphonewise for my D-EJ01. I've bought a portable headphone amp for $850 (US)made by HeadRoom, and I've bought the Sennheiser HD 600 headphones for $400 ! It sounds great ! none-this is the best portable cd player that you will find! I was able to buy the D-EJ01 on the internet, and it was refurbished. The internet store that I bought it from said that it broke, so they shipped it off to Sony and they fixed it. I have not noticed any small openings on mine on the left hand side of the loading mechanism. I have heard no hissing noises on mine either- I am told that this is because mine was hand inspected by Sony itself, A matter of fact, I haven't had the slightest problem at all with mine. However, the motor does create a loud noise compared to other cd players that I've heard. Also, the remote is hard to read in the sunlight, and the buttons can accedentally be pressed somewhat easily. Still, the good parts about it outweigh the very few problems-considering every product has its downsides. The D-EJ01 is easily the best portable cd that money can buy-say what you want, but it is! You should buy it if you can get it for under $200 (US). Paying over this price would be a mistake because the D-EJ01s are a few years old now, so many of its "top of the line" qualities are found on nearly all cd players now. My attitude toward Sony products in general has always been this: There are things made by Sony; and then there are consumer electronics. Right now I own two Sony Discmans, so I'm not really in need of another. But when I saw, yesterday, that one of my favorite stores here had the D-EJ01 on sale for only $98, I had to buy it, as this is the Sony model I've coveted since it was introduced. I figured that here, with the D-EJ01, Sony had pulled out all the stops in terms of features and build quality, without regard to cost, and then priced the product accordingly. Imagine my disappointment, then, when I got the thing home and found a build quality that could only be described as "chintsy": a spring-loaded battery door that was held closed by the merest fringe of thin plastc, and that looked like it would break at the first opportunity, or, if not, then quickly wear out; an over-all feel of thin plastic and cheapness; things mis-alligned in the way that is typical of poor quality control in mass production. Of special concern to me was the mis-allignment of the shutter door (which covers the slot through which the disc is loaded and ejected). The instruction manual was especially adamant about the importance of leaving this door closed to keep out dust and so on - so the fact that it was hanging half-open didn't bode well. Additionally, the supplied remote, while cool looking, wasn't very well designed; holding it in your fingers and pushing the volume controls on the right side, easily resulted in enough pressure being put on the left side to actuate the "stop" button found there. And the remote's display was largely unreadable in full daylight. The headphones supplied with the unit were of the earbud type and, while I didn't actually use them, they appeared to be an after-thought, very poorly made, with the thinest of wire and the cheapest of plastic. On the upside, the design appearance was very pleasing; and the sound quality the best I've heard in a portable CD player. Until now, people have been paying US$250-400 for this model. Given its weaknesses (and given also that my unit was defective), I didn't feel it was worth even the $98 I paid for it on sale - and returned it today for a refund. Several Sony Walkmans and Discmans spanning the past fifteen years. I bought the damn thing loooong ago, and after 5 months months of straight use of the thing, it just breaks!! It just stuopped using it...then i moved and now I am going to repair it after 1 and a half year of not using it. Gets attention better than a Lamborghini, Magnesium die-cast body is beautiful and durable, remote control that glows, MADE IN JAPAN!, amazing batteries, skinny, . Gets attention better than a Lamborghini, battery door latch is weak sometimes,lit up LCD display washes out in certain lights, questionable slide-in disc loading reliability. This CD player is amazing and I absolutely love it. The magnesium casting is durable and hard although I worry about it suceptibility to melting. I read up on magnesium and it is reportedly ''highly heat resistant'' so I am not worried as much as I used to be. I have never taken this thing jogging, nor have I ever dropped it. However, this CD player has been to my school (Valley Catholic) in Beaverton and everyone stares at it whenever I walk by with it. Change a disc and here they come! I''m scared to drop it because it''s ''my baby''. I ran a pen lightly across the top and it didn''t scratch it up. I have not had either the ''knocking'' noise or the ''hiss'' reported in other D-EJ01s. Mine has been perfectly trouble-free. However, my battery compartment door likes to fly open on its own accord when it gets severly giggled around. I think that''s due to a weak battery door latch. It''s only happened twice and really doesn''t concern me. Mine does, however have the tiniest of gaps on the disc-loading shutter. It''s too small to try to fit a dime through and that doesn''t concern me either. I recharged the batteries and put 2 fresh AAs into the tube and the battery gauge still reads full! I use it every day for hours on end, too. This CD player will soon be going on a cruise to Mexico in March, to Oklahoma and Massachusetts this summer and around my home town of Portland, Oregon for a lot longer than that. My only complaints are that the LCD washes out really easily in flourescent light or indirect sunlight and the track buttons are too easy to accidentaly activate when you use the remote. Otherwise, I''m all smiles! This CD player is great and anyone lucky enough to own one knows what Sony''s magic is capable of. None like it. This is in a class of its own! Great unit. Excellent Battery life. The sound from the unit is amazing. Simple sliding function. All the features you could ever want. CD-Text, optical Out, remote. 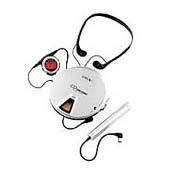 The best Discman I've used.